Santiago Iñiguez de Onzoño is the Dean of IE Business School. He studied at Madrid’s Complutense University and Oxford University, UK. Iñiguez de Onzoño is a Doctor of Law and holds an MBA from IE Business School. Iñiguez has worked as a management consultant and has played an active role in the field of quality control and development of management education in Europe. He is member of the boards of EFMD (European Foundation for Management Development), the International Advisory Board of AMBA (Association of MBAs, UK), GFME (Global Foundation for Management Education) and the Awarding Body of EQUIS (European Quality System). He has been portrayed by the Financial Times as “one of the most significant figures in promoting European business schools internationally”. 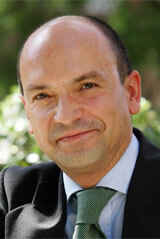 Iniguez is also President of the IE Fund in the US and serves on the boards of different companies based in Spain. As expert in management education, Iñiguez is a regular speaker at international conferences and frequently contributes in different academic journals and media on this subject. Iñiguez is Professor of Strategic Management at IE Business School. He has published several articles and case studies on business management. He is also author and co-author of several articles and books in the field of moral and political philosophy. Iñiguez is co-editor of www.deanstalk.net, a blog focused on management education issues.